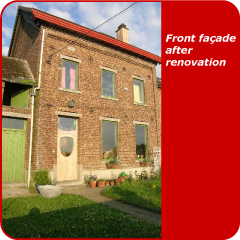 This project demonstrates that it is possible to renovate and revalue the old rural patrimony which has lost its former agricultural functions, and at the same time achieve performance levels according to current demands. Architect Pierre Deru respects the character of the original building, but also manages to integrate an organic aspect in a highly personal and distinct manner. Moreover, this project indicates a considerable amount of respect for both the environment and the health of living creatures by the choice of construction materials. The apparent decrease in energy demand was realized without the employment of highly advanced technologies.